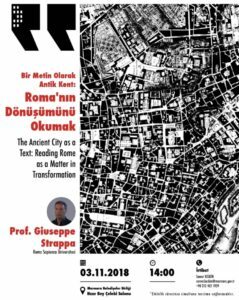 Simültane tercümenin olacağı etkinlikte İtalyan mimar Giuseppe Strappa tarafından İtalya’nın tarihi kenti Roma’nın mimari dokusuna dair temel morfolojik özellikleri ve bu mimari dokunun zaman içerisindeki dönüşümü aktarılacak. 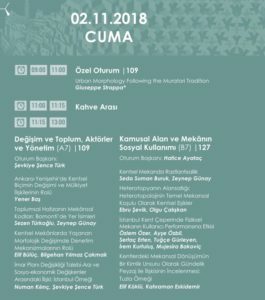 İstanbul’dan önce Roma İmparatorluğuna başkentlik etmiş Roma şehrinin tarihi yapısının sunulacağı programda; tarihi kentler, mimarlık, kentsel morfoloji gibi alanlarda bilgi ve birikim paylaşımı sağlanacak. From urban nodalities to urban fringe belts. The reading of the changes underway at the edges of contempo¬rary cities, where the countryside – often already partly urbanised – densifies and turns into urban matter, is one of the most difficult sub¬jects to tackle methodically. Proof of this is the descriptive literature produced on the topic, where depictions of an inextricable complexity and the suggestion of fragmentation, particularly amongst architects, have become true literary genres in themselves. The obvious obstacle is that the forms in which expansion takes place continuously evolve in time and space and seem beyond any rational, general law, while following a comprehensible process is an essential condition for the construction of a study method that can be communicated (and there¬fore of a design). The growing complexity of the phenomena that develop on the edges of the built environment, where rural areas prepare for change in ways that seem continually different, can be clearly recognised in post-industrial cities, but the uncertainty inherent in the tools we use to understand and monitor them was already apparent in the post-war period: the very period that attempted to create a limit to the irrational¬ity of cities in chaotic expansion by developing new tools for under¬standing them. As far back as the 1960s, the Conzenian school offered a clear inter¬pretation of these phenomena, attempting to generalise instances of interpretation developed for individual cities. This method originated in Alnwick’s exemplary study (Conzen, 1960) which, for that matter, we have published in an Italian edition due to the usefulness of the in¬formation it contains. The notion of fringe belt, which arose with these geographical studies – and initially fell on deaf ears (Whitehand, 1996) – was taken up with greater conviction in recent times, becoming a tool for analysis adopted by both architects and town planners. The method is based on recognising the urban plan, building types and land use as essential factors in determining the kinds of changes that take place. The common features of one or more of these factors allow us to distinguish fairly uniform areas (morphological regions), allow¬ing us to construct models of expansion where we can distinguish forms and phases. While the resulting model is spatially fairly simple, based as it is on successive rings that move out from the urban centre, its application to the actual built environment is rendered more complicated by the discontinuity of expansion, which usually occurs in stages of rapid growth alternating with periods of relative construction stagnation. M.R.G. Conzen discovered the link between these various phases of consolidation of the urban perimeter and the particular features of building types and land use that determine its form. This is interpreted as the relationship between the result of centripetal forces – particu¬larly obvious in the formation of the inner nucleus, the Central Busi¬ness District (CBD) – and centrifugal forces that push out towards the edges, infrastructure that does not require immediate access, as well as low-density single-family housing. This relationship between phases allows us to define the concept of ‘fringe belt’ as one that is linked to an urban phenomenon that recurs over time, that takes place at the margins between urbanised and rural areas when the growth of housing fabric stops or slows down abruptly, allowing the consolidation of urban structures through services and infrastructure encouraged by the low cost of these areas and the avail¬ability of land. In other words, some elements of the urban structure tend to be located on the margins of the built environment, creating specialised areas ‘around’ housing fabric. From the many studies that have been carried out, it is clear how the term ‘around’, whose meaning seems inextricably linked to the term ‘belt’, should actually be interpreted as a spatial hierarchisation rather than in its geometric meaning. To the point where there are many examples of growth across urban nuclei scattered throughout a territory, each of which forms its own fringe belt, before merging and forming new urban entities (see a number of the cases published here). The fringe belt concept, which emerged with the interpretation of historic cities and is often usefully applied to the study of walled cities (Whitehand, 2017), also seems to contribute to the study of both the growth of industrial cities as well as the more complex expansion of modern-day metropolises. In fringe belt foundation studies, particularly in the English-speak¬ing world, the benchmark example is the British metropolis, particu¬larly London. If, however, we consider the illegal urban sprawl typical of Mediterranean metropolises, consisting of detached houses on the edges of rapidly expanding housing areas, or the ‘informal’ expansion of South American and Asian cities, it becomes clear how, in many ways and with the proper caveats, the behavioural model features sig¬nificant analogies. Saverio Muratori clearly noticed, during the same period as Conzen’s research, the condition of crisis that saw post-war cities expanding chaotically and attempted to include them in efforts to trace the myr¬iad urban phenomena back to a common interpretation, to a rational whole that could be taught and passed on (Muratori, 1963). In the wake of his teachings, Gianfranco Caniggia provided us with a theoretical model of the forms of urban expansion that was very different to that of Conzen but that could be traced back to the same concepts when it comes to some of his general principles. What are, deep down, the infrastructures that are located on the margins of cities in the Conzenian model, that occupy the empty spaces consisting of cheap land if not the Caniggian model’s ‘anti-polar’ construction? And yet, Caniggia seems to refer, above all, to pre-industrial, organic cities that grow according to a modular law, through successive doublings, where each module is part of a larger urban organism and contributes to its life whilst nevertheless maintaining its original characteristics as a distinct and recognisable sub-organism. If we insist on a comparison, ‘mixed land use’ areas can be equated to the peripheral arrangements of partially specialised sub-organisms, in direct contact with rural ar-eas, that form during static phases of city construction. Both these interpretations, which complement each other in the interpretation of fundamental aspects of the expansion of European cities, are products of the cultural areas where they formed. However, both have been recently adapted – more or less explicitly – to the study of other urban areas, such as those of North America or China, which feature very different characters. In the early 1960s in North America, specific areas of growth were identified in the expansion on the edges between cities and countryside areas. Gerrit Wissink attempted to classify their typical features with specific characteristics in areas adjacent to the city ‘suburbs’, and more isolated ‘satellite’ areas in the territory, also considering their variations: ‘pseudo-suburbs’ and ‘pseudo-satellite’ areas (Wissink, 1962). Fig. 1 – San Martin das Flores in the state of Jalisco, Mexico. 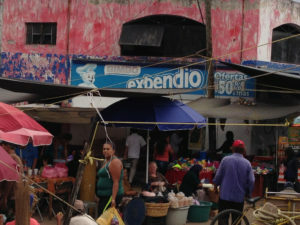 Sixteenth-century Spanish settlement turned into slums by the uncontrolled growth of Guadalajara. encourages the formation of distinct strips of anti-polar construction. Moreover, one should take into account the fact that the greater or lesser marginality of areas of potential city expansion does not depend on their distance from the centre, but rather on complex factors, in¬cluding their accessibility, which has relevant influence, due to the very nature of American cities. This situation leads to an early division of properties and a change in the size of building lots, smaller near areas of expansion but with a significantly higher value. The development of fringe belts here is therefore less continuous and often opposite to development in radial strips, sometimes following a linear, though discontinuous, form of expansion along transport arteries and, at other times, a growth of ‘clusters’ scattered throughout the territory, depending on a method intrinsic to the market-driven rationale of intense speculative activity and few town planning regulations. The distance from one’s workplace, often located in the CBD or at its edges, combined with the extensive use of private transport and the formation of associated large-scale infrastructure, contributes to the complexity of this multi-faceted model of growth that is so hard to generalise. Thus the concept of the rural-urban fringe (R-U fringe) emerg¬es, understood to mean the transitional zone that, in Western cities, indicates a discontinuous territory and a contradictory landscape on the border between city and countryside, made up of extensive areas featuring specific, recognisable characters. One character that is usu¬ally identified with R-U fringe is due to the particular condition of its inhabitants, who live there despite not being part of the place either economically or socially (Herington, 1984). It is, moreover, a structural phenomenon linked to the inexorable growth of the urban population, which has for some time now overtaken the rural population (over 54% in 2017), with a percentage growth that seems relentless. This explains the renewed interest in the concepts of ‘fringe belt’ and ‘R-U fringe’, which still seem suited to interpreting the new, uncontrolled phenomena (that are, nevertheless, dynamic and innovative) of the market-led expansion of cities, where new anti-polar structures are often placed beyond the immediate administrative limits not only of large cities but also of small towns, in peri-urban areas that are hardly regulated, occupied by a combination of detached single-family houses and large entertainment complexes, commuter districts and noisy small businesses that cities push to their margins, areas used by undertak¬ers and warehouses of all kinds, shopping malls and venues for large events, concerts and festivals along the edge of farmland. The fact that concepts that have now become traditional, such as those of the fringe belt and R-U fringe have, for some time now, been placed at the centre of design project instruments for areas in urban expansion, succinctly tackling spatial as well as political and social problems, is proof of the attempt to establish the latest town planning frontier, limiting the fragmented city (Gallent, 2006). 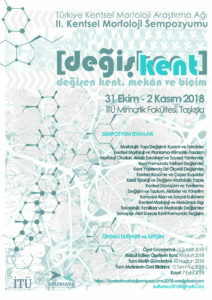 However, we cannot deny that the idea of limits, which once con¬stituted one of the pillars of urban studies from the post-war period on, is now definitively in crisis, together with that of a perimeter, which was not only used as a planning tool but also as a mindset, allowing us to establish distinctions and borders. Nevertheless, I believe that architects and town planners are not al¬lowed to accept reality as it is (contrary to the aesthetically pretentious movement that has recognised in the disintegration of every order the representation per se of the modern world). Often disorder, if ob¬served methodically, contains its own explanation, multifarious aspects of manmade principles that can be recognised and analysed rationally. In any case, the model used to interpret and critically explain the phenomena of urban expansion is not just a scientific tool: it is also knowledge in action, it contains a design project. I believe we need to ‘designedly’ seek out the form of cities that expand, even in their seem¬ingly chaotic, formless parts (Strappa, 2012). 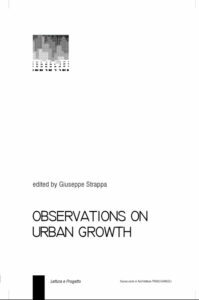 This book compares and contrasts a number of essays on urban expansion that examine case studies located in various different geo¬graphic areas: from Europe to Asia, from North to South America. Fig. 4 – Spontaneous ridge routes in the expansion of Mexico City. It is not, however, just a comparison of urban samples. What interests the editor is to compare interpretational models derived from experi¬ence that come under the umbrella of Urban Morphology, developed in different cultural contexts that nevertheless share the conviction that the form of a city, even in its most seemingly chaotic incarnations, can be interpreted rationally and contains the seeds of future change. Caniggia, G., Maffei, G.L. 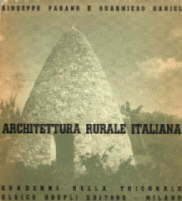 (1979) ‘Composizione architettonica e tipo¬logia edilizia 1.Lettura dell’edilizia di base’ (Marsilio, Venezia). Conzen, M.R.G. (1960) ‘Alnwick, Northumberland: a Study in Town- Plan Analysis’ (Institute of British Geographers, London). Gallent, N., Andersson, J., Bianconi, M. (2006) ‘Planning on the Edge’ (Routledge, London). Herington, J. (1984) ‘The Outer City’ (HarperCollins, New York). Lammers, D., Pereira Roders, A., Van Wesemael, P. (2016) ‘Radial fringe belt formation’, Proceedings of the 22nd ISUF Conference, Rome 2015 (U+D, Rome). 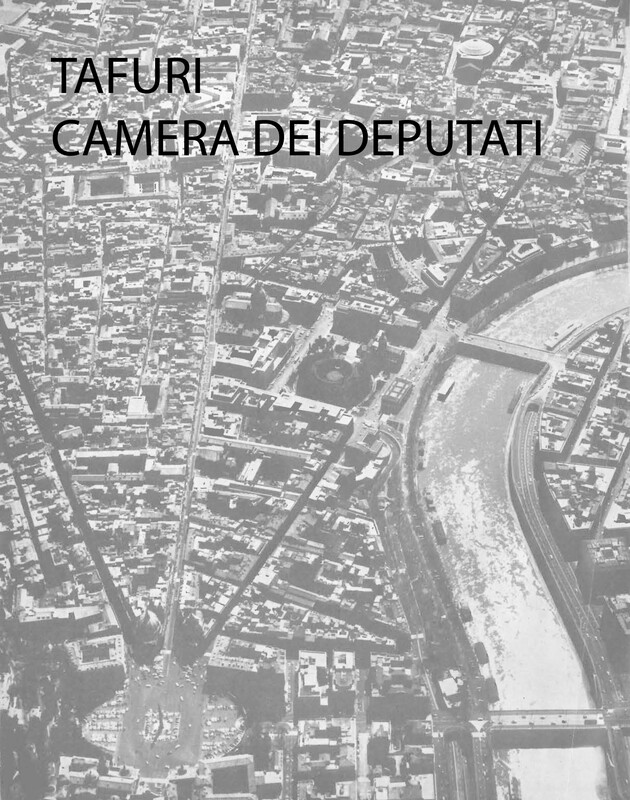 Muratori, S. (1963) ‘Architettura e civiltà in crisi’ (Centro Studi di Storia Urbanistica, Roma). Strappa, G., ed., (2012) ‘Studi sulla periferia est di Roma’ (FrancoAnge¬li, Milano).